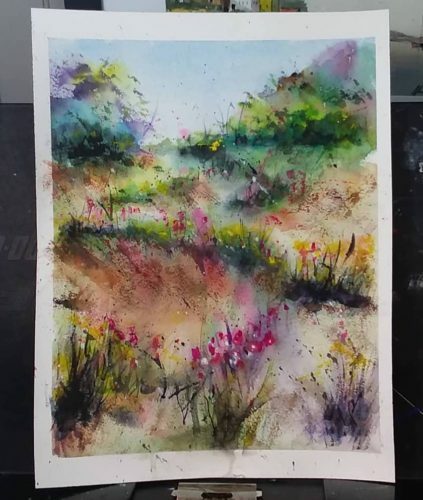 ‘Wildflowers in the Meadow’ is a recent class demo painting by Alan James. DEEP RIVER — Award winning watercolor artist Alan James, will hold a one-day workshop at Deep River Library, Monday, April 15, that is designed for those who want to learn the process of how to capture the essence of a scene. The workshop will run from 5:30 to 7:45 p.m. In this class, James will share all of the secrets of what he calls “Capturing the Essence,” which is the process of simplifying the subject by eliminating superficial details. Through step-by-step demonstrations and one-on-one guidance, he will show you how to take your initial inspiration through his process in creating an expressive painting that is strong in both composition and content. Registration is required for this program. You may register on the website or find the link on our Facebook Events page. The class is free, but participants must provide their own art supplies. A list of materials needed are on Alan James’ website.